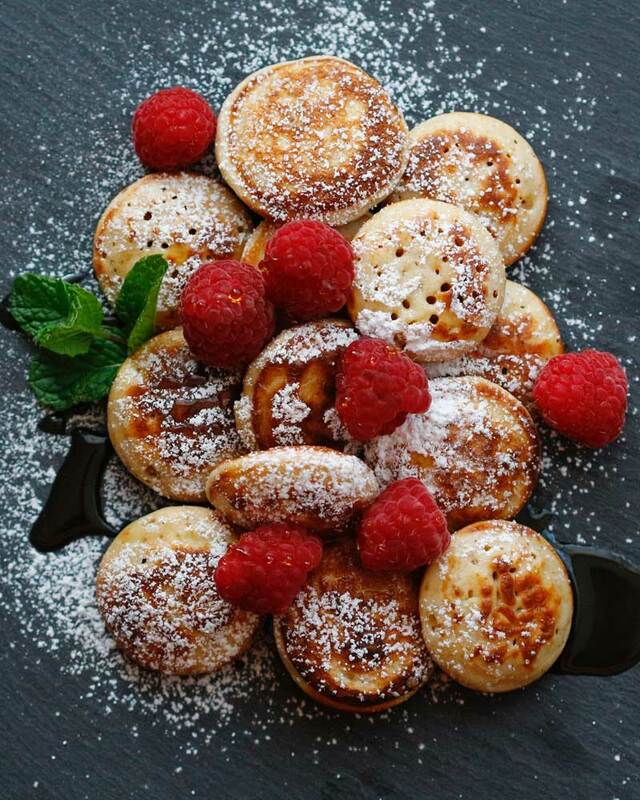 Poffertjes are pancakes with a difference. Also called mini dutch pancakes, they are traditionally made with yeast using a mix of wheat and buckwheat flour. Here is my sourdough dutch pancake recipe, including yeasted version. Mmmm… the aroma of freshly baked pancakes is so comforting. We love them in all shapes and sizes. But poffertjes have become my favourite lately. They are nicknamed mini dutch pancakes. 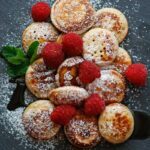 Poffertjes are traditionally made with a mix of wheat and buckwheat flour and leavened with yeast, as opposed to self raising flour. 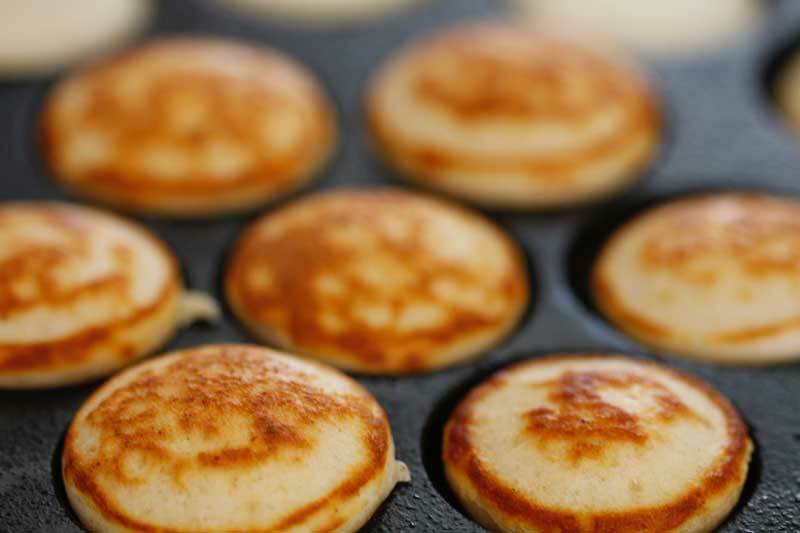 To achieve the typical puffed look, they are baked in a special poffertjes pan. Poffertjes are fun to make, even more fun to eat. My first taste of mini dutch pancakes was years ago at the Tesselaar tulip farm. They were on my ‘to make’ list for a while, but I didn’t have a proper poffertjes pan. I could’ve made them in a regular pan, but they would look more like blini. Then I stumbled across a brand new mini poffertjes cast iron pan in an op-shop – a real bargain for three bucks. After seasoning, it was good to go. Being a fan of all things sourdough, I played with different sourdough batters for poffertjes. I used different ratios of wheat and buckwheat flour, different sourdough amounts, and even made the batter almost entirely from surplus sourdough starter. Pancake batter with 40-50% buckwheat was really light and fluffy, with enough buckwheat taste. I quite liked 90% buckwheat poffertjes, too. The 10% wheat flour came from the starter. As buckwheat flour is gluten free, it’s easy to make gluten free dutch pancakes if you have gluten free sourdough starter. In addition to buckwheat and wheat flour, to make dutch pancakes batter you need milk, eggs and salt. 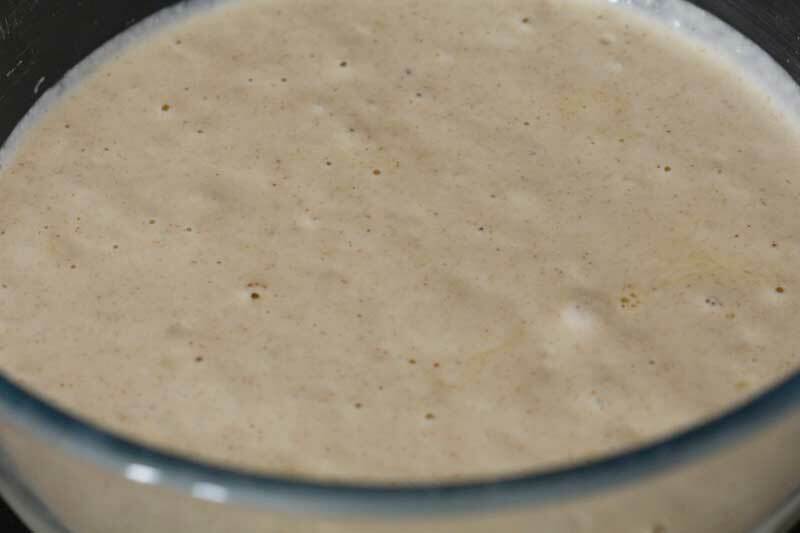 If you don’t already bake with sourdough starter, you can easy make your own. For yeasted poffertjes version please see Notes in the recipe below. Here is a photo of the 40% buckwheat and 60% wheat flour poffertjes batter. Once your batter is ready (ingredients and steps explained in the recipe below), pour it into a squeeze bottle. Alternatively use a jug or a teaspoon, but that can be messy. A squeeze bottle will give you better control over the amount of batter, as well as precision. In the meantime, heat the poffertjes pan on medium-high heat and grease with butter. Fill the poffertjes pan indentations full to the rim. That way, when the mini pancakes puff up, they will form a dome and will be the same shape as the bottom side. Bake the pancakes for a few minutes until bubbles appear on top. Use a bamboo skewer, a toothpick or a fork to turn them and bake the other side for a minute or two. 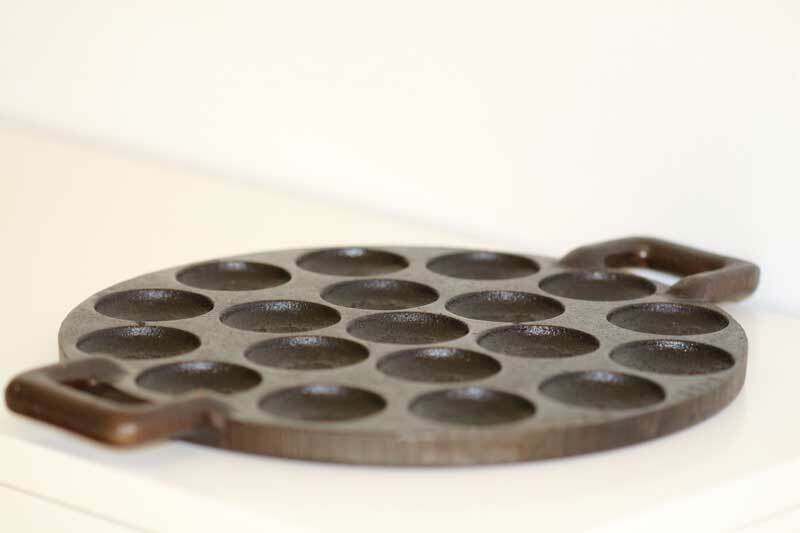 The mini poffertjes pan I have has 19 holes. I easily make around 100 mini dutch pancakes. It might sound like a lot, but they bake fast and it doesn’t take long to make them. 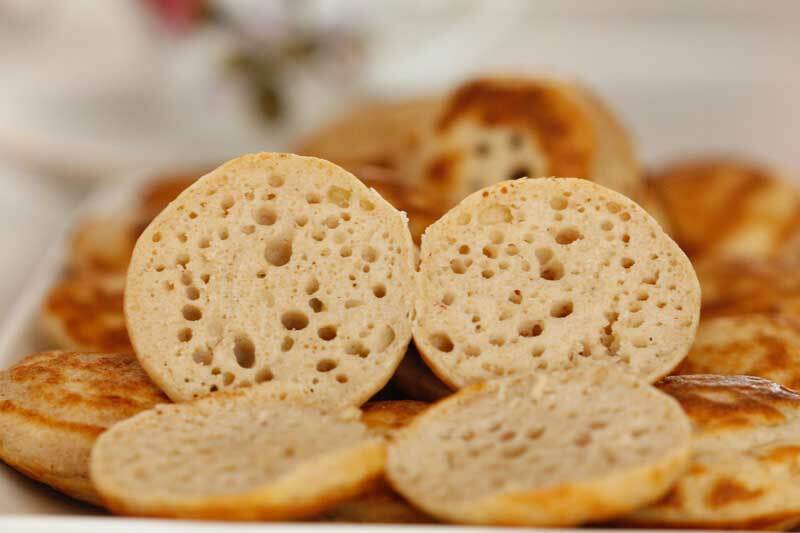 Below you can see sourdough buckwheat poffertjes cut horizontally – spongy and bubbly inside. Serve dutch pancakes warm, dusted with icing sugar and melted butter as the Dutch do. Or perhaps pour maple syrup, add fruit, cream and anything else you fancy. But I have to warn you: you might make 100 pancakes, but they disappear like lightning! Enjoy. Puffy and light dutch poffertjes are pancakes with a difference. Fun to make, even more fun to eat, traditionally made with yeast and buckwheat flour. Here is the sourdough dutch pancake recipe including yeasted version in Notes. Serve warm dusted with icing sugar and melted butter, maple syrup, fruit or toppings of your choice. This recipe uses 40% buckwheat, 60% white flour (including sourdough starter). You can change the ratio to suit your taste. Yeasted version: Mix 180g plain white flour, 120g buckwheat flour, 6g salt (1 teaspoon) and 3,5g dry yeast (1 teaspoon). Add 360ml lukewarm milk and 2 extra large or 3 small lightly beaten eggs. Mix into a smooth batter. Leave in a warm place for 1-2 hours until batter becomes bubbly or in the fridge overnight. Bake as per instructions for sourdough dutch pancakes. Different flours absorb liquid at a different rate. Adjust if the batter is too thick or thin. The pancake batter should be pourable. If the batter is too thick, the pancakes will be dense. If it's too runny, the poffertjes will stay quite flat. 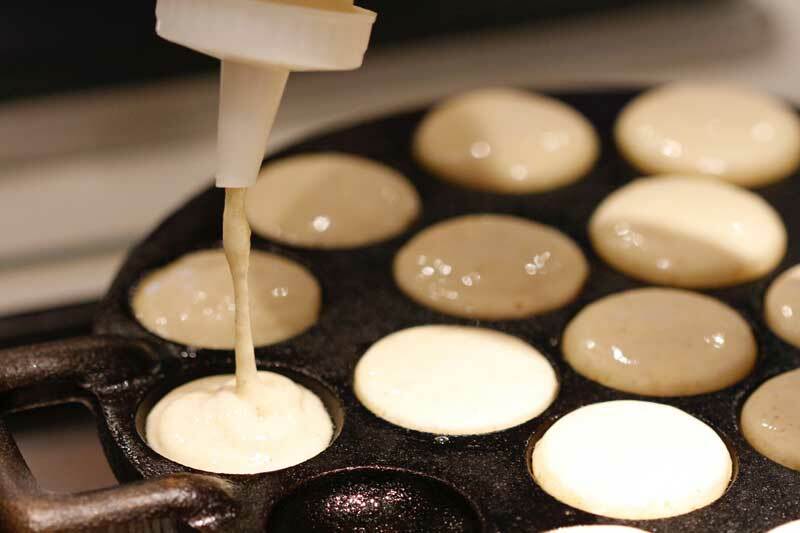 Lower the cooking temperature if the poffertjes are burning underneath but top is still liquid and without bubbles. They are best eaten fresh Josh. Maybe you can keep them in an airtight container for a day or two. What do you mean by “refreshed” starter? I regularly have discard (unfed) . By refreshed I mean starter that has been fed, is active and ready to make the dough with. Same as for your sourdough. Unfed discard would not be strong enough. Feed your discard and it becomes starter for the pancakes. I do not trow away any of my sourdough starter, just keep smaller amount and do a larger feed when needed.